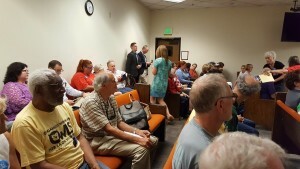 Activists, including from OWLS packed the Courtroom in Olympia on July 29. 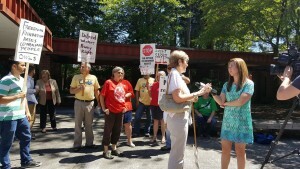 KCPQ interviews an SEIU member about the FF goal — every worker earning starvation wages. In an unfortunate decision Friday, July 29, 2016, Thurston Superior Court Judge Mary Sue Wilson ruled in favor of the ultra-conservative and anti-union Olympia based Freedom Foundation. The decision gives the foundation access to the first and last names, and middle initial of all Washington State employees who belong to a union. In addition, the state of Washington will provide the well funded rightwing foundation with the date of birth and employee e-mail addresses, impacting the privacy of thousands of public workers. Arguing on behalf of union members were three women attorneys, Laura Ewan, Kathleen Barnard, and Kristen Kushman. They stressed the need for individual privacy, protection from misuse of information including identity theft, and the potential risk of retaliation and abuse of workers in the criminal justice system. A white male lawyer, David Dewhirst, dressed in an expensive dark two piece business suit, wearing dorky looking light tan winged tipped shoes, and having an appropriately sheared skinned head, argued for the regressive Freedom Foundation. And another white male, Assistant Attorney General for the State of Washington, Andrew Longerwell, disappointingly neglected to give any meaningful support to the unions and impacted employees. Judge Wilson, in her decision, noted that the Freedom Foundation openly declares its purpose is to “defund and bankrupt public employee unions.” She said the State’s Public Records Act does not allow her to rule broadly and that the foundation’s motives of fundraising, and political speech are constitutional rights. Therefore, she lifted the temporary injunction against the foundation’s request for public workers’ contact information. The Freedom Foundation admitted that it will use the information the State provides them to determine employees’ addresses through use of registered voter lists. The organization will then use door to door canvassing to contact union members and “make them aware of their rights.” But union members already know their rights. They don’t need a bloated male dominated wealth tank to tell them how to think. The foundation’s Dewhirst also criticized about two dozen labor activists — members from a wide spectrum of public and private sector unions — who had peaceably packed the court room. Apparently his rights are more important than the rights of ordinary working people who also belong in a court room. After Judge Wilson reached her decision the activists convened outside the courthouse for an impromptu rally and strategy session called by Organized Workers for Labor Solidarity (OWLS). Predictably, following Dewhirst’s disrespectful comments, another Freedom Foundation cohort stopped by and revved up his Japanese made motorcycle in an unsuccessful effort to disrupt the peaceful protest. This individual, whose vehicle license number was photographed, hoped to make it impossible for anyone to speak, or hear. Is this the Freedom Foundation’s definition of constitutional rights? Only the rich have constitutional rights? Only the 1%? Only the corporate oligarchy? Attorney Laura Ewan said “We understand where the court is coming from. The court is bound by what the Court of Appeals decided in the SEIU 775 case. But we feel like we have a chance on appeal…we are going after different information… The legislature needs to do something, because this is not the intent of the Public Records Act. The Public Records Act was there to be able to allow us to make sure our government is using our taxpayer dollars in the way that it is supposed to do. It is not to harass union members for their decision to be union members… We are going to keep fighting.” The judge did not grant their request for an emergency stay, but won a commitment from the Freedom Foundation to wait until Tuesday, August 2, to receive workers private information from the many State agencies impacted by the decision. Patrick Burns, a union carpenter who helped OWLS organize carpools from Seattle to the hearing, met with applause when he summed up the crowd’s sentiment, “an injury to one is an injury to all,” and vowed to continue fighting.